The Smark Henry RAW Review (10/9/18): Are You Ready... For These Heel Turns?! - Smark Henry | The voice of Filipino wrestling fans | Philippine Wrestling Revolution, WWE, and more The Smark Henry RAW Review (10/9/18): Are You Ready... For These Heel Turns?! The Smark Henry RAW Review (10/9/18): Are You Ready... For These Heel Turns?! It's the RAW after WWE Super Show-Down and we're already rolling with fresh developments for WWE Evolution (not the stable) and WWE Crown Jewel. Well, as fresh as they can be. Some of us have already seen some of these things with our smark's eye, especially since these developments seem mighty logical for WWE Creative. Still, there were a few surprises here and there, like one of the two heel turns of the night... or the result of the main event. Or how that World Cup thing was going to work. Spoiler alert: The World Cup thing isn't as big of a tournament as some of us, namely me, expected. Two United States representatives in a World Cup? Come on. I'm not gonna lie, I'm 50-50 on this whole DX versus Brothers of Destruction thing for Crown Jewel. That Triple H versus The Undertaker match at Super Show-Down—congratulations to my ex Peyton Royce, and her friend, the new WWE Cruiserweight Champion Buddy Murphy, who'd have thunk? !—was pretty good, mostly because it brought tears of nostalgia to my manly man eyes. But Kane is a mayor now and I am legit concerned about HBK taking more bumps than necessary. It might just be because he's really good at selling; but I'm worried it might also be because he's much older now and I don't really want to see or hear about another Sting buckle bomb or Kevin Nash quad tear. Come on, Shawn! You're a Hall of Famer and people all over the world love you. You've got nothing to prove to Mr. Michelle McCool and the new mayor of Knox County. Still, the promos were great and made for an electric opener to a hot Chicago crowd. Oh, crap. We're in Chicago?! CM Punk chants incoming. We've all known about Nikki Bella facing WWE RAW Women's Champion "Rowdy" Ronda Rousey at Evolution, right? So this heel turn shouldn't really have come as a surprise to a lot of us. Some of us might've even expected this to happen after this Super Show-Down rematch. 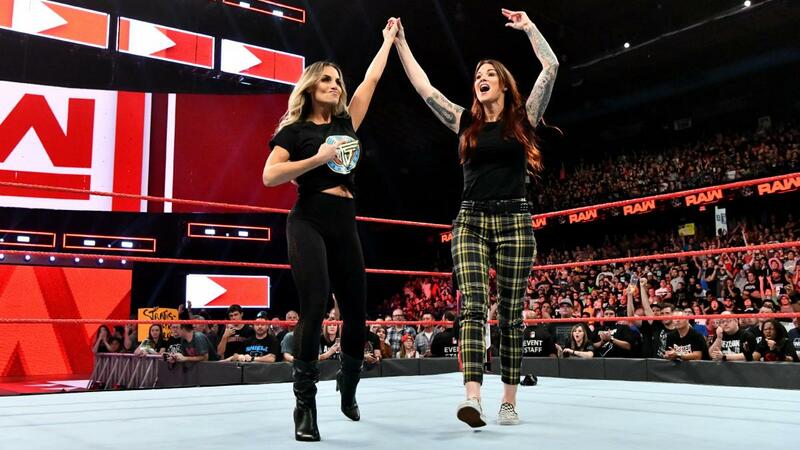 Because her bloodlust wouldn't be satiated until she managed to tap out all three members of the Riott Squad in just a mere of days, Ronda just had to make a game Ruby Riott tap. I mean, there's no topping that double armbar tapout at Super Show-Down, but I guess Ronda really wanted to dominate and embarrass the punk trio. Unfortunately, in the end, Rousey was the one embarrassed when she got beat down by Brie B(otch)ella and the better Bella twin, Nikki. I just can't believe the Bella Twins were able to take Ronda down when no other group of women has. Not the Riott Squad in all their triple teaming glory, not Absolution in all their double teaming glory, and certainly not the cunning Alexa Bliss and her veteran besties Mickie James and Alicia Fox. Ah, the power of having your own reality television series. At least you're not facing Brie, right, Ronda? Liv Morgan would want that "honor." Acting RAW GM Baron Corbin is hella rude. Heath Slater is good enough to have been part of that World Cup Global Battle Royal, especially since it was all an attempt for Corbin to sneak his way into that Crown Jewel match by beating up no-name jobbers bordering on stereotypes. What a douche. Thankfully, The Conquistador returned and foiled Corbin's plans, revealing himself to be none other than... Oh, my god, it's CM P—Kurt Angle! Wait, if Angle's technically still on vacation, doesn't that render his victory here null and void? Whatever. John Cena didn't even have to qualify and he has no Olympic gold medals around his broken freaking neck. Psh. All in all, this was pretty hilarious. Wait, Trish Stratus isn't a fan of Alexa's Moment of Bliss segment from last week? Lies! It's great to see Trish back on RAW again, though. It's clear she's no longer in her prime, flubbing her lines here and there and being slower than how we remember her, but I mean it's been a while, so let's cut her some slack. Alexa's "I was born in the wrong generation" promo was hilarious but interesting. If she debuted at the same time Trish did, would Alexa really have overshadowed the latter? That's hard to say. One, the whole height thing might be a factor. Two, Trish had to do weird, sexist things back in the day, and weird is an understatement. It's a tough call for sure, but bottom line, both Trish and Alexa are great performers in their own, respective rights. The same could be said for both Mickie James and Lita. I guess a tag team match at Evolution between these two teams would be so much better than the previously announced singles matches, especially for Lita and Trish, who could be fighting some ring rust. Great move in delaying that Lita moonsault, too. A great tease if nothing else. 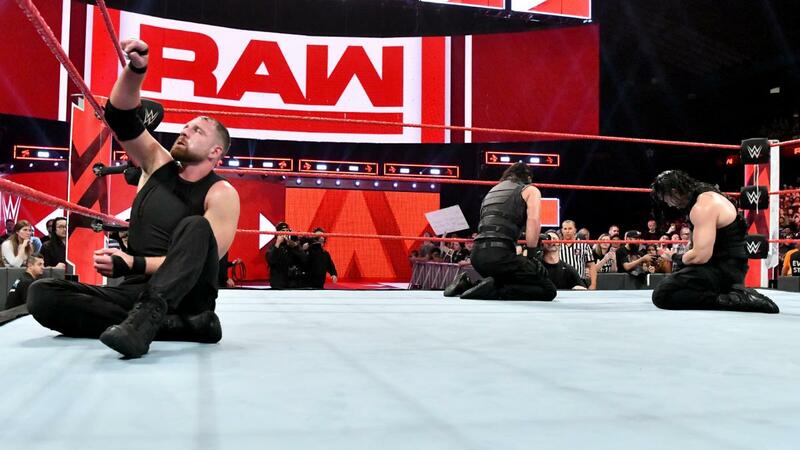 Despite the turmoil their team faced backstage before the main event, as well as the teased implosion during the actual match, the Dogs of War managed to beat The Shield, all thanks to Drew McIntyre and his horrifying Claymore. I'll give props to The Shield for that pretty nostalgic taped promo, though. But before all that, Paul Heyman did his thing, hyping the Crown Jewel Universal Title Match involving champion Roman Reigns, Braun Strowman, and his client Brock Lesnar. Nice touch. The match that followed was also great, even though they tried to plagiarize that Cedric Alexander versus Drew Gulak suplex-to-the-outside spot (too soon, brah). Drew pinning Dean was the right call here. The finish adds to the intrigue and gives the right man from the Dogs of War a pretty decent boost. Dean walking out on his Shield brothers was just amazing. In case you guys didn't see the post-RAW interview with Dean, he apparently doesn't know if he fits anywhere anymore, so he just walked out after losing the match. I liked how the intrigue went all the way up with this new development, especially after what happened at Super Show-Down, but isn't Dean supposed to not really give a damn if he fits anywhere? He's the Lunatic Fringe, after all. 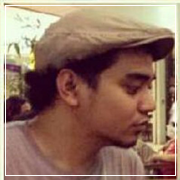 He's crazy, unexpected, a wild card... Why would he give a damn if he fits anywhere? It works better if he's more not sure if he should still be doing Shield things when he could be challenging for a title. Dean's gotta Dean. That or he's not okay with how his return has been going so far, how he feels like he's disappointing himself and his Shield brothers, how he doesn't feel as good as he did before his injury. There's plenty of reasons that doesn't diminish his "screw what you guys think, I do what I want" attitude but makes it a whole lot more personal. 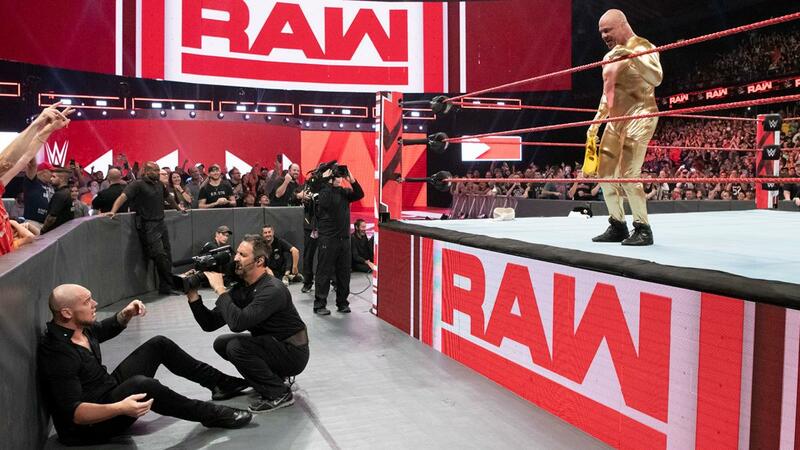 RAW REVIEW: The more things change—and boy, did RAW change a lot with its status quo!—the more they stay the same, am I right? 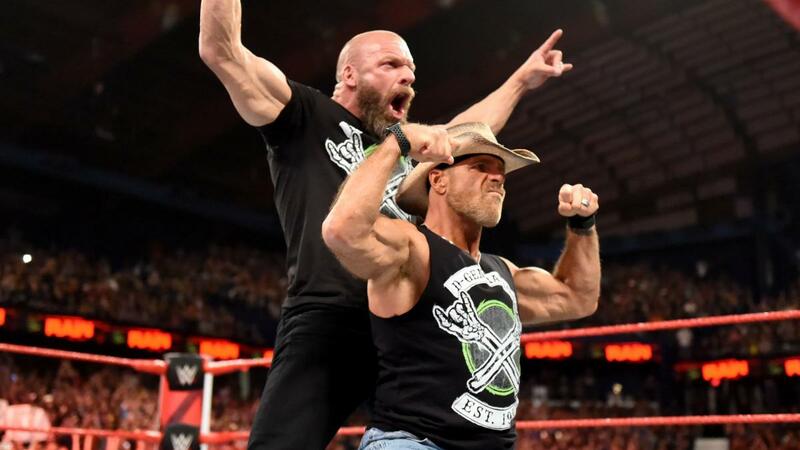 We've got DX back, at least until Crown Jewel. We've got Trish Stratus and Lita back, at least until Evolution. We've got Kurt Angle back, at least until maybe just this RAW? We've got heel Bellas again, another injured Canadian at the hands of a more interesting Bobby Lashley (thank you, Lio! ), and Dean Ambrose continuing to tease the end of The Shield in 2018. Is The Shield fine? Where's Cody when you need him? I'm giving this week's RAW a C for "Chicago punks." Bobert Lashley is a turd. My best friend in the whole wide world, Kevin Owens, is a Canadian hero. You don't break the legs of a Canadian hero, Bob! Lio Rush was pretty entertaining—annoying?—on the mic at ringside, though. This was the first heel turn of the night, and I've got to admit, I'm pretty curious where this is going. Lashley seems to be better suited in this role. At the very least, he's more entertaining here than with the previous weirdness Creative subjected his character to. No one cares about your sisters, Bob! Team B&B beat Mahalicia (really?!) on this week's RAW. This was a Mixed Match Challenge reminder or something, with the match further establishing Mahalicia (really?!) as the jobber team of that show's second season. That said, Team B&B's promo before this match was interrupted by Lio Rush and Bobby Lashley to further cement Lashley's heel turn, which I thought was pretty great. I just hope that it wasn't a hint about Finn's next feud. At least not if they're just going to feed Finn's abs to Lashley's weird grin. Another entertaining Elias promo from Elias. Is he picking a fight with John Brad—Cena? I can't wait to see him do this kind of promo on Crown Jewel. Can you just imagine—It's not happening, is it? After Konnor got to have a winning streak against Chad Gable and Bobby Roode individually, Viktor got pinned to once again remind everyone that The Ascension isn't getting a tag team title reign any time soon. That implosion within Glorious Gable may happen soon enough, though, especially with that confused reaction from Roode after the blind tag by Gable. Yeah, Bobby, kid's stealing your spotlight. Destroy him. Beat him up while wearing an awesome suit. Do it while you— Oh, god, it's AOP! The AOP just destroyed both teams and saved me from yawning! What a strange but welcome turn of events. Ember Moon beat Nia Jax by count out and then Jax raised Ember's hand and they also hugged in the ring. Okay. I was more looking forward to seeing an Eclipse finish, but then again, I wasn't really expecting to see this match because I thought these two were doing a best friends angle and would have more tag team matches before facing each other down the road. Jofer Serapio (@ShawarmaJoe) reviews WWE RAW for Smark Henry. His favorite professional wrestling shows include NXT, Lucha Underground, WWE, NJPW, Ring of Honor, and (gasp) Impact Wrestling. He pops hard for Samoa Joe, Marty Scurll, Kevin Owens, Drew McIntyre, and Andrade "Cien" Almas.